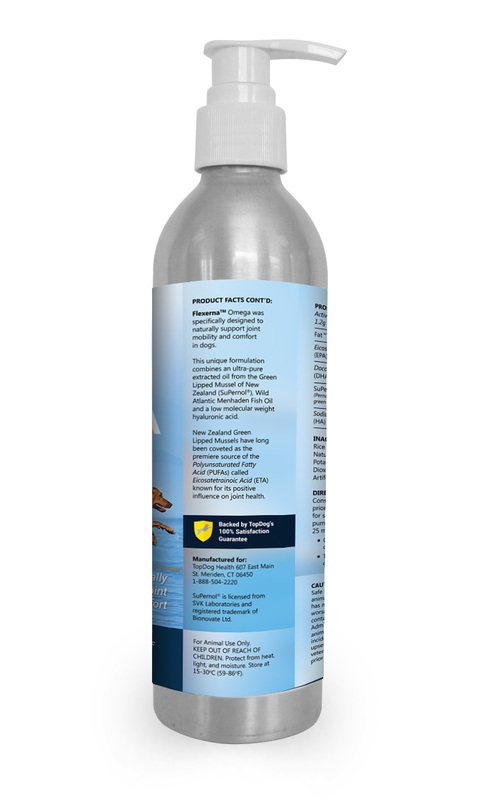 Flexerna Omega® is a patented and research proven powerful natural anti-infammatory produced using the extracted oil of the coveted Green Lipped Mussel of New Zealand, natures leading source of Eicosatetranoic Acid (ETA). Easy-to-use and tastes great – dogs love it! 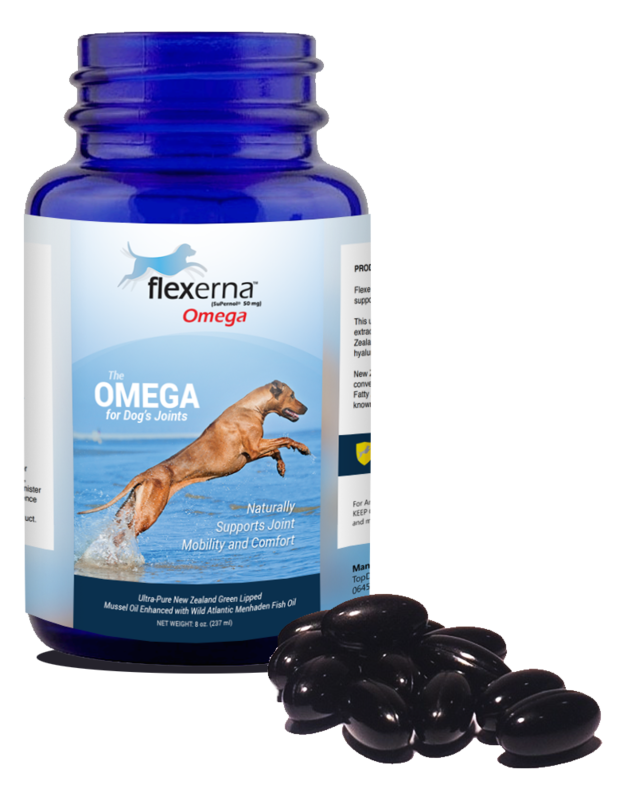 Flexerna Omega® is a patented and research proven powerful natural anti-inflammatory produced using the extracted oil of the coveted Green Lipped Mussel of New Zealand, natures leading source of Eicosatetranoic Acid (ETA). TopDog’s No-Risk All-Results 100% Satisfaction Guarantee Policy.Guaranteed to work for your dog or your money back. * We stand behind our products. Learn more about our 100% satisfaction guarantee. Flexerna Omega 3-Formula is a one-of-a-kind, all-natural joint supplement that is uniquely formulated with SuPernol® – a concentrated, purified, potent oil from the green lipped mussel that is far more effective in supporting joint health than fish oil – which makes Flexerna the most complete, powerful omega-3 supplement for your dog. At TopDog Health, we believe that being proactive in preventing health problems is one of the best things you can do for your dog. Whether your dog is a puppy, an older dog, or anywhere in between, Flexerna’s proven formula includes the essential, high-quality ingredients to support their overall joint health, prevent potential issues, improve mobility, and decrease discomfort – so your beloved pet can enjoy as many long walks, brisk runs, and tail-wagging adventures as possible! We’re passionate about creating the most effective, highest-quality products to help your dog live a long, happy, and healthy life – using only all-natural, scientifically-proven ingredients that don’t harm the environment. Enter Flexerna and the green lipped mussel. What makes green lipped mussels so unique and efficient in improving joint health is their diverse omega-3 profile. 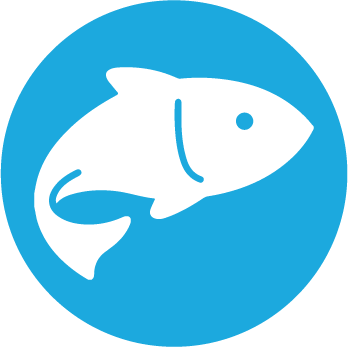 Unlike fish oils used in most supplements which only contain 2 kinds of omega-3 fatty acids – Eicosapentaenoic Acid (EPA) and Docosahexaenoic Acid (DHA) – the green lipped mussel also contains a third called Eicosatetraenoic Acid (ETA). This complete combination means less inflammation, less pain, and more mobility for your canine companion. Flexerna also contains the only green lipped mussel oil with a patented extraction process to optimize purity and concentration. 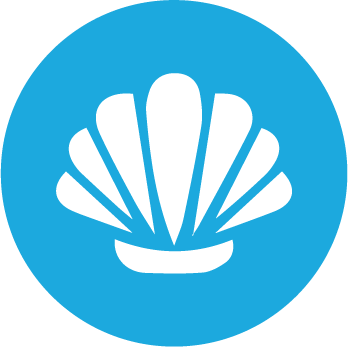 Plus, our mussels are grown in New Zealand in some of the purest waters in the world, and harvested using a process that is biosustainable and does not harm the environment like overfishing. This means you can be confident you’re giving your dog the purest, most complete joint supplement available, without sacrificing quality or the environment. 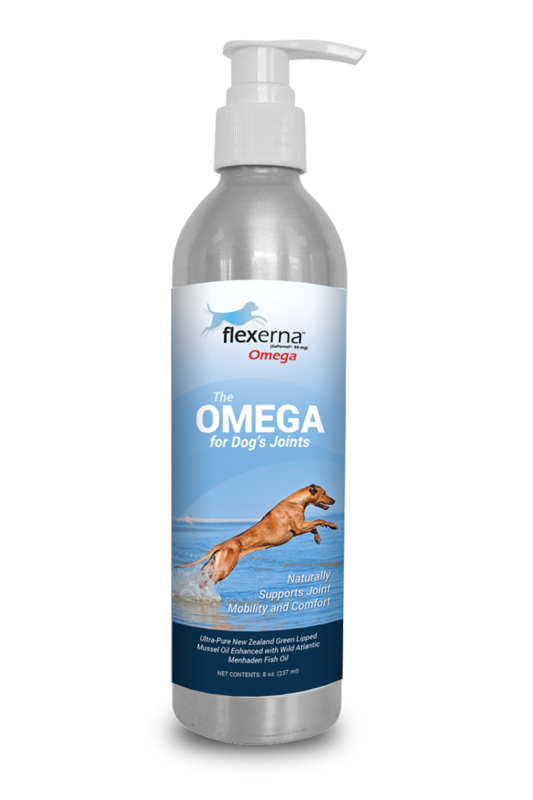 Puppies to Older Dogs can benefit from Flexerna Omega®. Being proactive in preventing problems is the best thing to do. **Based on independent research studies. Studies available upon request. These statements have not been been evaluated by the FDA. These products are not intended to diagnose, treat, cure or prevent disease. All TopDog products are manufactured and/or packaged in an FDA inspected facility. Supernol® is a registered trademark of Bionovate Ltd. There are two types of omega fatty acids: essential and non-essential. Your dog’s body can produce the non-essential ones on its own, but it needs to receive the essential fatty acids from food sources. There are two kinds: omega-6s and omega-3s. If your dog eats kibble or canned food, it’s almost certain they’re getting enough (or even too much) omega-6s, but omega-3s should be given in the form of a supplement. The magic of omega-3s (and the reason they’re so beneficial to your dog) lies in their ability to reduce inflammation. 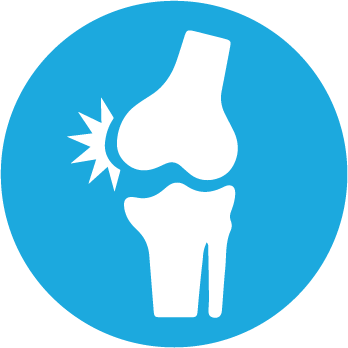 Reducing inflammation is key in relieving joint pain from arthritis, hip dysplasia, or an injury. Plus, low-grade chronic inflammation is at the root of countless joint and other chronic diseases (think arthritis, heart disease, and even cancer), and omega-3 supplements help keep this in check. 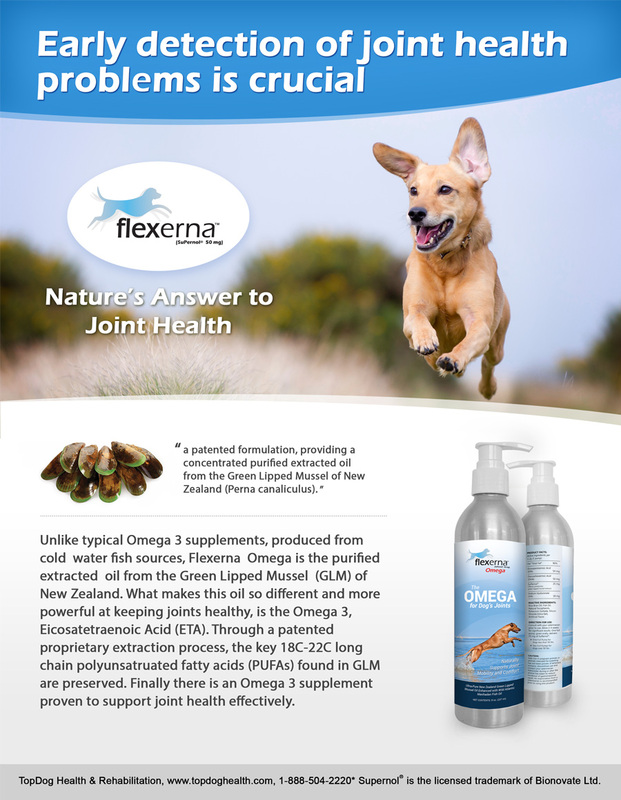 Wondering if your dog really needs an omega supplement? Read More Here. These two well-known omega-3 fatty acids reduce inflammation by blocking the enzymes(lipoxygenase and cyclooxygenase) that contribute to it. They work harmoniously together and are found in most omega supplements. 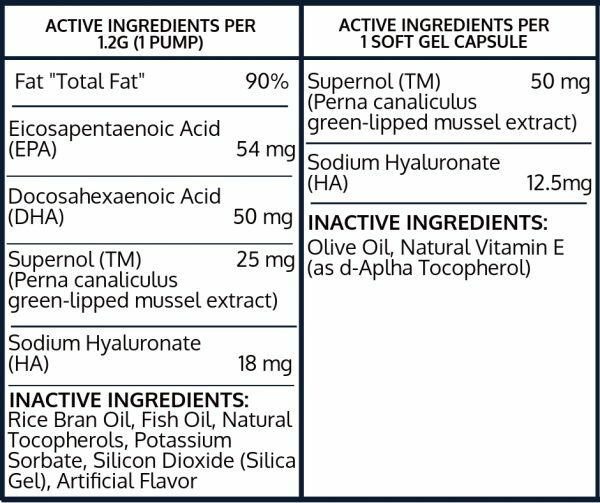 Unlike fish oils, green lipped mussel oil contains not only EPA and DHA, but also ETA(eicosatetraenoic acid)– which goes one step further to actually work at the gene level to lower the production of cyclooxygenase (which contribute to pain, fever, and inflammation). This lesser-known fatty acid is the powerhouse ingredient in Flexerna, which makes it more effective at reducing inflammation than your typical omega-3 supplement. 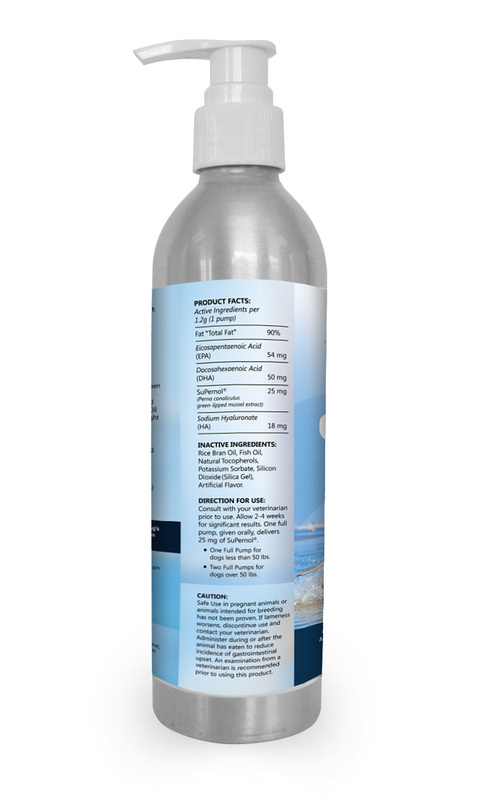 Flexerna Omega® has been shown to contain high levels of a lipid, a long chain fatty acid (20 + fatty acid residues) called Eicosatetraenoic Acid (ETA). This omega three has been shown to be stronger than EPA and DHA alone. 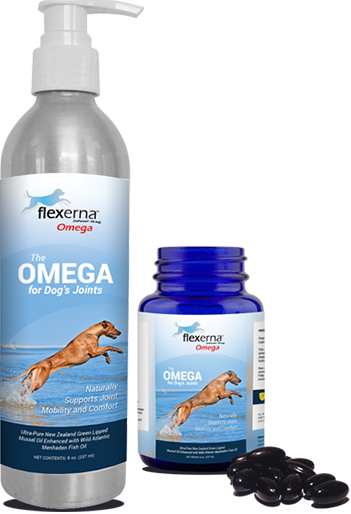 Whether your dog has or has not previously been on an Omega supplement, TopDog recommends a proper loading dose phase for Flexerna Omega®. Therefore, in the first 10 days the maintenance dosage is doubled. Though many dogs show improvement in only a few days, it is best to allow 4-6 weeks of continual usage to see the full results. In order to achieve the full benefits, daily administration is critical. Our black Lab had TPLO surgery in January 2011. We had him on Deramaxx (anti-inflammatory) and a different brand joint supplement. Before he went into surgery, the surgeon ordered a blood panel, which showed elevated kidney levels due to the Deramaxx so we immediately took him off the medication. So now we had our dog having to go through the whole healing process without an anti-inflammatory. 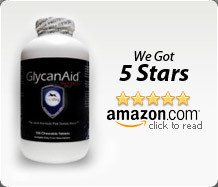 I was very worried, until I found the TopDog website, read about their supplements and spend some time browsing through testimonials. 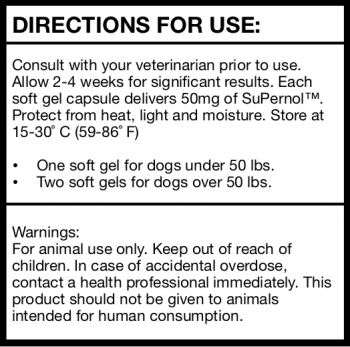 I ordered Flexerna (a natural anti-inflammatory) and the joint supplement and switched our dog from his old supplement to the new one the day we had it in the mail. What can I say, he never had any issues with inflammation and he is doing so much better on the TopDog supplements, than he ever did on Deramaxx and the other brand supplement! Thank you so much TopDog for making my pup feeling so much better.